Pasta dishes are easy to miss when you’re following a low-carb high-fat diet. I mean, sometimes you may find yourself craving the carbohydrates themselves. But if you’re following a low-carb high fat diet consistently, you probably don’t really miss those head rushes and crashes, the body discomfort and bloating, or the pasty gummy threads that stuck to the roof of your mouth. But pasta provides a wonderful base for sauces, particularly all those rich, creamy Italian sauces that you remember. While eating low-carb high-fat foods lets you use all the cream and cheese you want, sometimes it’s hard to find the right foundation to carry that. I’ve heard it said that the best use for vegetables is as a carrier for fats. And one of my favorite vegetables for carrying fat into my mouth is the treasured zucchini. I may have mentioned before how zucchini spiral slicers can convert your average garden variety zucchini into a credible substitute for spaghetti. And that works great for hearty red sauces and meat sauces, where the pasta isn’t the main ingredient. So I wanted to see how zucchini spaghetti would hold its own against one of my favorite all-time Italian sauces: Carbonara! And I am delighted to report that it is a perfect complement. The firm, toothy texture of zucchini spaghetti, cooked in a rich, creamy carbonara sauce, reminds me of my favorite al-dente preparations of spaghetti. Furthermore, zucchini spaghetti is much more forgiving of long cook times. And it can be cooked right in the sauce, so it takes on the flavors perfectly. Here’s my recipe for the ideal Zucchetti Carbonara. This will serve four, but it’s also easy to pare down for two on those romantic evenings, or even one when you need a little time to yourself. 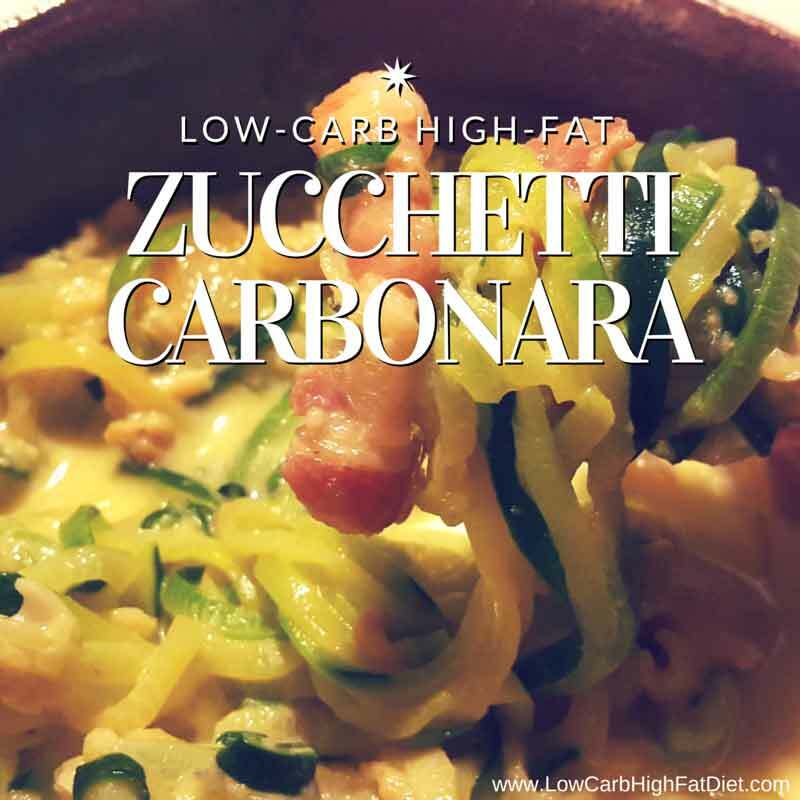 This is one of the fastest low-carb high-fat gourmet meals you will ever have! That’s all there is to this amazingly simple and delicious recipe. If you want, you can add some more cheese at the end, or a sprinkling of fresh parsley for color. Personally, I always add a little more cheese at the table, and you can keep your parsley. Let me know how it works out for you. You won’t ever look at a zucchini the same way after this! I suffer from low blood sugar headaches and in a book that I consider my bible, it showed that I needed to eat low carb high fat, which is how I came upon your site. Your menus are interesting but I would like to ask this question: I am intolerant to dairy and have had to give it up. What would you suggest in its place that would be an equal to the dairy that you recommend? I’ve looked at dairy substitutes, like soy/rice cheese and others, but their ingredient content show them to be more of something out of a lab than from nature. Hi Susan. That’s a good question. Personally, I recommend not trying to replace anything you love with something that will never match it for quality, flavor, or health benefits. That said, if you can figure out what it is you miss about specific dairy foods (eg: the creaminess of butter, the freshness of milk, or the thickening abilities of cream) you can start to find alternatives (such as egg yolks, nut milks, or gelatin) that will let you learn to appreciate new foods. But if you always compare them to what you remember, instead of appreciating them for what they have to offer, you may always see it as a loss of something old instead of an introduction to something new. Good luck, and let me know what you try!